Oil companies are among the largest and most profitable corporations in the United States, and yet our government gives them billions of dollars in tax breaks and subsidies, many of these sponsored by elected officials who receive huge contributions from the industry. From Washington to Helena, we support fossil fuel producers at the expense of the communities in which we live. 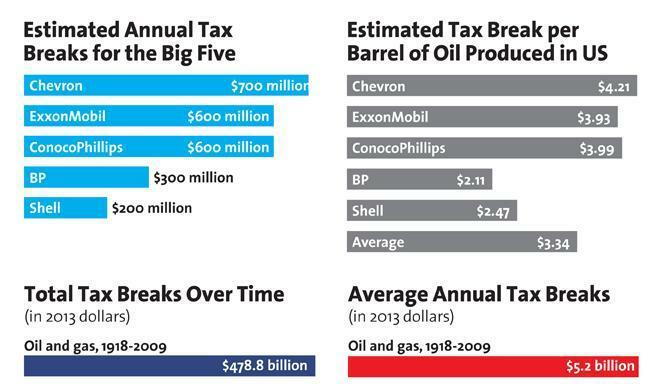 Let’s start by looking at the incredible size and profitability of Big Oil. 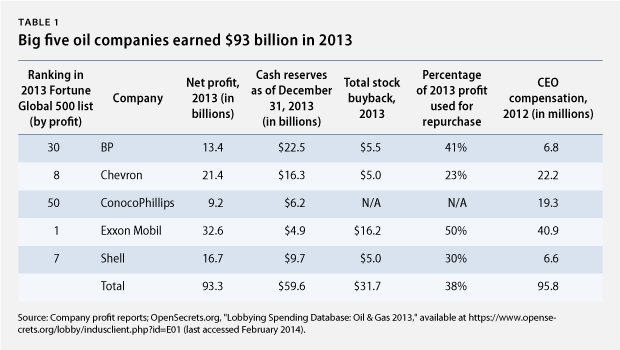 These companies are hugely profitable, as you can see by clicking on the chart at right — the five largest oil companies in the United States earned $93 billion in profits in 2013. On the 2012 Fortune 500 list of the largest US companies by revenue, ExxonMobil ranked first, Chevron third, and ConocoPhillips fourth. HUGE companies. Despite the size and enormous profitability of Big Oil, the US has showered $470 billion in tax subsidies on the industry since Marathon Oil began drilling in Carbon County, Montana 100 years ago. Many of these subsidies are rooted in oil and gas issues that are a century old, but Congress continally renews them as the oil companies keep pouring those dollars back into lobbying and direct campaign contributions. 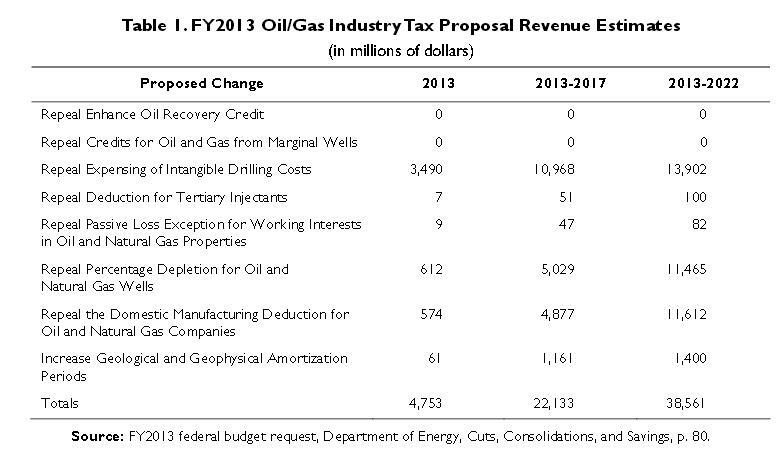 Intangible drilling costs (IDC) deduction. IDCs are the costs of designing and fabricating drilling platforms, as well as direct “wages, fuel, repairs, hauling, and supplies related to drilling wells and preparing them for production.” These costs can represent 60-80% of the cost of drilling a well, and the IDC deduction allows them to be deducted immediately. But that’s not the way it works in practice. In the tax code depletion has been completely severed from the concept of recovering the capital cost of oil production. It effectively makes a certain portion of gross income tax-free without regard to capital costs. James Dean: Bale, l’ll tell you what old Pinky thinks….That oil tax exemption is the best thing to hit Texas since we whooped Geronimo. One of the finest laws ever passed in Washington. The percentage depletion has changed over time, but it still allows deduction of 100% of the profit from a well. Percentage depletion was first passed by Congress in 1926. Today it’s annual cost to taxpayers is $612 million – $1.1 billion. Domestic Production Activities Deduction. Included in the American Jobs Creation Act of 2004, this deduction amounts to about a 2% reduction in tax for manufacturing costs that could be imported overseas. While this makes sense for a variety of goods that could be exported, it makes little sense in the oil industry. The jobs associated with producing oil from domestic wells cannot be exported in the same way that jobs producing consumer goods might. You can’t, after all, import jobs extracting oil from a Bakken well to China. The annual cost to US taxpayers of this exemption is $574 million. I doubt that you will be surprised that this proposal was ignored by Congress. There are many other oil and gas exemptions in the Tax Code. The TCS brochure goes into nine of them in detail, and I recommend you download it and read it if you’re interested in how Congress continues to subsidize Big Oil. Since 1999 the Montana legislature has granted a huge additional subsidy in the form of a tax holiday to oil and gas producers. Operators pay a tax of only 0.5 percent of the production value of a well for the first 12 months of production on all wells and 18 months on oil and gas from horizontally drilled, or fracked wells. The tax rate set by law is 9 percent. The reason the holiday is set for 18 months is that, for a horizontal oil well, the vast majority of the production occurs in the first 18 months. 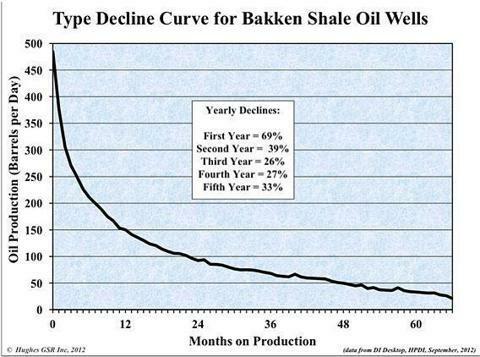 As you can see from this graph, production declines by 69% in the first year alone, and by about 80% after 18 months. In a nutshell, the 18 month holiday is pretty close to a free pass on any significant taxes on a horizontal oil well. In the most recent legislative session SB374, introduced into the Senate Taxation Committee by Senator Christine Kauffman of Helena, would have imposed a “trigger” on the current tax holiday that would require oil and gas companies to pay the full 9% tax when the price of gas rises above $52.59 a barrel. The bill failed to make it out of Committee. So there will be no changes in the Oil and Gas Tax Holiday before at least 2017, and there is no reason to think that this Montana holiday will be any different from the permanent tax breaks enacted 100 years ago in Washington. A proposed Shell refinery in Pennsylvania is in line for $1.6 billion in state subsidy, according to a deal struck in 2012 when the company made an annual profit of $26.8 billion. The deal was struck by the then-governor Tom Corbett, who received over $1 million in campaign donations from the oil and gas industry. Shell has also spent $1.2 million on lobbying in Pennsylvania since 2011. ExxonMobil’s upgrades to its Baton Rouge refinery in Louisiana are benefiting from $119 million in state subsidy, with the support starting in 2011, when the company made a $41 billion profit. The deal is championed by Governor Bobby Jindal, who has received 231 contributions from oil and gas companies and executives totalling $1 million over the last decade. A jobs subsidy plan worth $78 million to Marathon Petroleum in Ohio began in 2011, when the company made $2.4 billion in profit. In 2011 Governor John Kasich was the leading recipient of oil and gas contributions in Ohio, at over $200,000. The same year Kasich appointed Marathon Petroleum’s CEO to the board of Jobs Ohio, a semi-private group “in charge of the economic growth in the state of Ohio”. 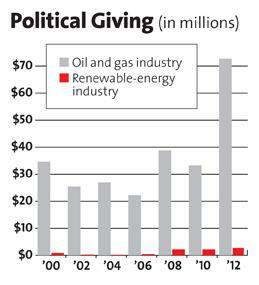 With the passage of Citizens United, the amount of political giving by the oil and gas industry has exploded, as indicated in the chart from Mother Jones at right. We can only expect more of these play-for-pay oil subsidies in the future. 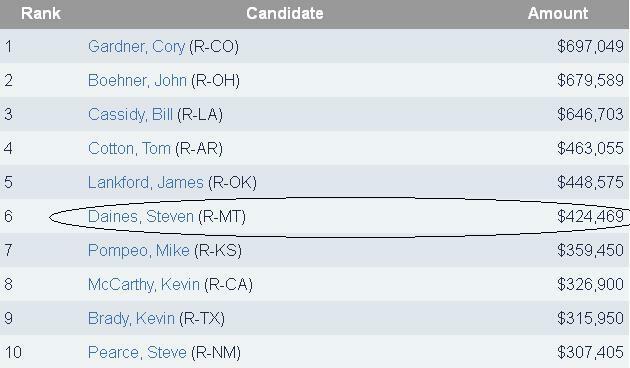 And finally, while this isn’t a political blog, I’d be remiss if I didn’t mention that 90% of oil and gas industry contributions go to Republican candidates. In the end, it’s all pretty simple. The government unnecessarily pays the richest companies in the nation to make huge profits pulling fossil fuels out of the ground, and refuses to regulate those companies in a way that protects landowner rights and safety. This entry was posted in Community Organization and tagged Big Oil, Bobby Jindal, BP, campaign contributions, Christine Kauffman, Conoco, Domestic production activities deduction, ExxonMobil, Intangible drilling costs deduction, John Kasich, Montana Oil and Gas Tax Holiday, Shell, Special percentage depletion allowance, Steve Daines, subsidies, tax exemptions, Taxpayers for Common Sense, Tom Corbett. Bookmark the permalink. Excellent explanation of hydrocarbon industries’ subsidies. And these big dogs also work tirelessly to prevent or kill any policy / tax incentives for renewables. Please keep speaking truth to power, Mr. Katz. Thanks Bob. Trying to understand the magnitude of the control Big Oil has over government is like peeling the layers of an onion: you keep finding more and more, and the deeper you get the more you cry.